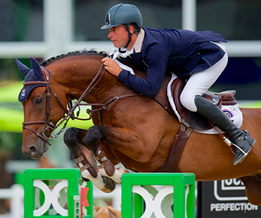 For years Gert-Jan Bruggink ranks amongst the international top riders. He participated in the Olympic Games and European and World Championships. With the legendary Joël, Gert-Jan Bruggink achieved great successes. Now he has two exceptional Grand Prix horses in Vampire and Ulke. At Oosterbroek Stables horses are bred to later on train to be successors of the current tophorses. ‘De Lutte’ in the region of Twente is home to Gert-Jan Bruggink. More information about Gertj-Jan? Visit www.stalhetoosterbrook.com. Together with her husband Gert-Jan Bruggink, Pia has been part of the TRUST team for years. Pia represents the German flag and has been succesful at the international competitions for quite a while. She competed in numerous Grand Prixs and won amongst others the ones in Barcelona and Mannheim. In the grey Charmeur Pia has found a partner for the highest levels. 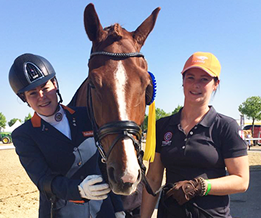 Recently the pair placed second at CSI Geesteren. More information about Pia Luise? Visit www.stalhetoosterbrook.com. Stephanie is perceived as one of the greatest young talents. 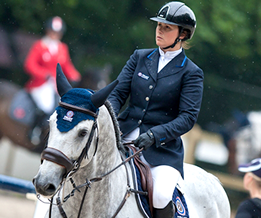 She already won a silver and bronze medal at the European Championships for Young Riders. 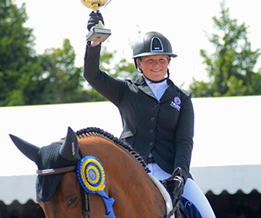 Stephanie is a rider for Grevlunda Stables, homebase to Peder and Lisen Fredericson in Sweden. Her talent brought her to prestigious competitions and she seems to have a succesful career ahead in the international show jumping sports. Lisen participated in the Olympics Games twice. She also won the prestigious Grand Prix in Rome and the Falsterbo Derby. 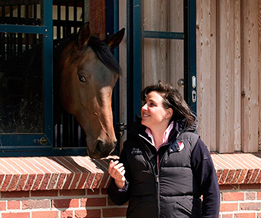 Lisen is the initiator and ownre of the ‘Swedish Select Horse Sales’. In 2010 the International Olympic Comité selected Lisen as an ‘Athlete Role Model’. Together with husband Peder Fredericson she runs Grevlunda Garden in Zweden and she is a familiar face on Swedish television. Sanne has been included in the B-squad Para dressage with Vedet PB (s.Florestan I), Zoya Sollenburg (s.Métall) and Demantur (s.Vivaldi). In 2001 Sanne got in an accident and was entrapped under her horse. This caused additional physical damage, on top of the limited leg function she had since birth. According to the experts horse riding would not be wise for Sanne, but never riding again was not an option for her. With her motto: “With an ultimate goal to aim for, the world is at your feet and pain will become relative again.” she accomplished many highlights. My top horse Winston is performing even better since he received a TRUST bit set. The anatomic shape and Sweet Iron let him accept the bits well and he gives me a great feeling! I completely trust the quality of TRUST bits. In their collection you will find a fitting bit for every horse. It is a great honor for me to be one of the TRUST ambassadors. I use the TRUST bits and rugs already since a long time, because they are very functional and have a high quality standard. I am proud to wear the name and logo of TRUST! I use TRUST bits for multiple horses and I experience that many horses accept the bit much better. A second advantage of TRUST bits is that there is a wide range of products. In eventing you need many types of bits. Because TRUST has numerous models in the same materials, my horses do not have to get used to the bit each time. My horses and I enjoy working with the TRUST bits every day. The horses take the bit well and we have already achieved many wonderful performances! With a TRUST weymouth and bradoon TC Athene and I won gold twice at the 2016 European Championships for Young Riders! All our horses and the horses of our students are ridden with TRUST bits, and we are already showing results! The horses really like the bits and are even more nice to ride.